Posted on Wed, Feb 29, 2012 : 4:49 p.m. The Michigan football team will host a pro day March 15 for players who will not return to the program next season. At least 15 players will attend the event, according to a Michigan spokesman, although their participation levels will vary depending on health and other factors. The pro day participants, as confirmed by Michigan: defensive tackle Mike Martin, center David Molk, receiver Junior Hemingway, receiver Martavious Odoms, tight end Kevin Koger, tight end Steve Watson, defensive lineman Ryan Van Bergen, linebacker Marrell Evans, receiver Kelvin Grady, offensive lineman Mark Huyge, linebacker Brandon Herron, cornerback Troy Woolfolk, cornerback Tony Anderson, long-snapper Tom Pomerico, tailback Michael Shaw. Players who will not participate, as confirmed by Michigan: linebacker J.B Fitzgerald, fullback John McColgan, safety Jared Van Slyke, defensive lineman Will Heininger. The only remaining senior is safety Zac Johnson. It is unclear whether he'll participate. The pro day is much like the NFL Scouting Combine, in that players will audition for NFL personnel in various speed and strength drills. There also will be positional drills (receivers catching passes, linemen doing bag work, etc.). It is closed to the public and media. Martin will make an appearance, but said he plans to do only positional work. He will not do any strength or speed drills after finishing among the top four defensive tackles in every category at last weekend's combine. Hemingway is in a similar situation. He told AnnArbor.com before his combine appearance that he would be at the pro day, but skip drills that went well for him in Indianapolis. He had a strong all-around showing, including finishing among the top-three receivers in the bench press, cone drill, 20-yard shuttle and 60-yard shuttle. He finished 19th in the 40-yard dash, but hit his goal with a time of 4.53 seconds. Molk's participation will depend on his health. He had surgery in January to repair a severed tendon in his foot, which kept him from running at the combine. 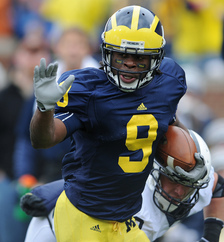 He told AnnArbor.com he hopes to run a 40-yard dash at the pro day, but it would depend on his rehab and the advice of his surgeon and agent. He is unsure whether he will bench again, after posting 41 reps at the combine. Sat, Mar 3, 2012 : 7:07 a.m. I think this is a great idea, you got 15 of the best players in the country coming together for a showcase - I just wish they would invite some of the former players. You won't see anything like this up north or down south, maybe two or three little brothers, mostly spouting off their mouths for a workout. Sat, Mar 3, 2012 : 5:10 a.m.
Common Tom, they are competitors who play as much for themselves as they play for your entertainment. They want to challenge themselves and see how they measure up. It may be the last football related thing they do. Let them enjoy their day. Who knows? Remember Jeremy Lin. Sometimes good things happen. If you don't have your line in the water, you'll never catch a fish. Fri, Mar 2, 2012 : 6:45 p.m.